In the mystic land of Egypt, weapons will give you victory! Raise your armies, unleash your divine powers, summon creatures, take control of temples and join the battle! Let’s face it, if there’s one thing better than ancient Egypt, it’s ancient Egypt plus warriors mounted on giant scarab beetles charging into epic battles. 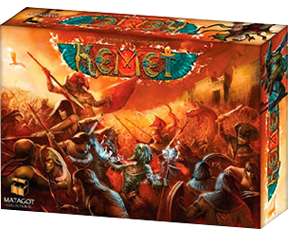 From the company that brought us the excellent Cyclades comes Kemet, a no-holds-barred, confrontational arcane Egypt battle game packed with plastic, cardboard and fantastic illustrations. This is a game that rewards you for getting out and amongst it, preferably with a teleporting army with some giant snakes and sphinxes backing you up. This is kind of game the EOG loves: great production, relatively easy rules but lots of options for strategy, and a fantastic theme just dripping with atmosphere. One thing I find slightly annoying, however, is the resolutely multilingual nature of the game. While I realise Matagot is saving considerable money by creating one game in six languages and without a word of text on any of the cards or tiles, it can also be a bit frustrating when there is such a variety of powers and special effects on offer. Also the English rules translation could be better. Hopefully this rules summary (which includes information from the FAQ) and reference fixes those small problems and makes the game faster and easier to play. So awesome! I found a very sturdy razor blade or strong utility knife is the way to go for cutting foam-core generally speaking. Everyone likes x-acto and as I do love mine and use it quite often, it is not as easy and heavy-duty. Feels safer too. LOVE LOVE LOVE this format! One question though. How do you prevent the tokens in the small tray from spilling over into each others’ slots? Perhaps a clever spacer implementation to raise the tray flush with the top of the insert? 🙂 Just sayin. I designed this before I’d seen your ingenious idea! I usually rely on just keeping the box level at all times, but your idea is great. Or, you could make two shallow trays of two spaces each instead of just one. This is just a beginning! Glad you like the new format. Thinking I’ll go with a white background next time for ease of printing though. True. And white background would also fit the aesthetic of the rest of the site better. Cleaner, crisper. On the other hand though, the black allows for a defined border in the headline space where white would not. . .hmmmm. The defeated player must decide between recalling his troop (see below), or retreating. If he decides to retreat, the battle’s winner has to choose the adjacent space, free of any units, to where the opponent’s troop will be repelled. If there is no adjacent space with no units on it, then retreat isn’t possible. The way I understand this ruling is that the loser has to retreat or recalling his troop is he loses. Even when to attacker has no troops left! Now when the Ta-Seti add on is out in the wild—got my copy yesterday—any plans on updating this one to include it? It doesn’t look like I can update it properly without a copy of the expansion. I may buy it eventually, but it’s not on the short term list. Hey thanks for this! Your work is absolutely beautiful and so refreshing to look at. I wish companies would use you to design their rules and organize their games. Great work. I also had an idea i think you should add: a sort feature to find all the games for which you have foam board designs. That’s a great idea Andy, I might do that. I noticed that the player aid for the Ta-Seti expansion is missing the section with the DI cards! Any chance of having an update on this? I think you’ll find the new DI cards and the old ones on the reference sheet.